Shopping for Kingdom Hearts Statues? 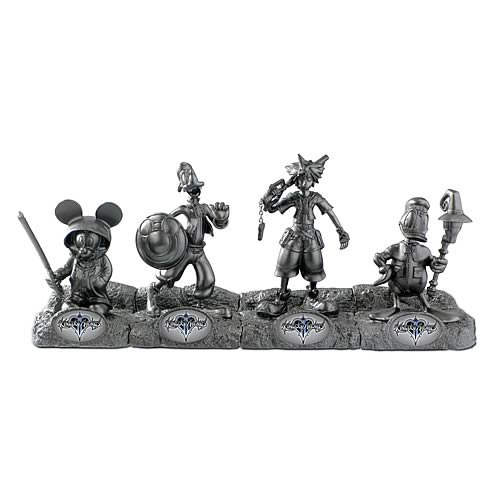 Based on the action-roleplaying video game Kingdom Hearts from Disney and Square-Enix, this faux-silver-plated Kingdom Hearts 2012 SDCC Exclusive Mini-Statue 4-Pack includes sculptures of Mickey Mouse, Goofy, Sora, and Donald Duck. Each resin figure boasts identifying features to match his look in the video game, with Mickey Mouse carrying his sword, Goofy his shield, and more! A limited edition of 200 pieces, this San Diego Comic-Con exclusive 4-pack is a wonderful collectible for fans of Kingdom Hearts. Ages 3 and up. Item comes in the same black box as presented at Comic-Con. Measures 13 1/2-inches by 3 1/2-inches by 6-inches when displayed as a group.